Is there anything more refreshing than a cold, therapist crisp Mojito when it it’s 200 degrees outside? I don’t think so. Nothing says summer like lime and ice and mint leaves. Roasted potatoes? Those are more like fall and winter. A summer potato is usually smothered in mayo and plopped on a picnic table. Delicious yes, obesity but sometimes cold potato salad isn’t what I’m craving. So, here’s my attempt to bring the refreshing summery-ness of a Mojito to the lowly potato. I roasted them with garlic, olive oil, lime zest and salt, then tossed them with lime juice and fresh mint. The caramelized potatoes and garlic added just the right amount of sweetness so that it really reminded me of a Mojito. The lime and mint brightened them up and added a good bite. They were really good and kind of addicting in that way that only roasted potatoes can be. Although I loved them this way, I think I’ll try a cold, salad version of this recipe next time. Just boil the potatoes instead of roasting them and toss them with the rest of the ingredients once they’re cool. I bet that salad would be a big hit at my next BBQ! Preheat the oven to 400° and toss the potatoes with the garlic, olive oil, salt and lime zest. Spread the potatoes onto a cookie sheet in an even layer. Bake for 30 minutes, or until the potatoes are golden and slightly crisp. Remove from oven and place the potatoes in a bowl. Toss with lime juice and mint leaves. Serve immediately. Makes 4 – 6 side servings. This sounds awesome! Thanks for the great idea! You always have the best recipes! Great idea to spice up the old roasted potatoes. I bet this would be great for a summer BBQ especially since it doesn’t contain any mayo. YUM! Really brilliant. 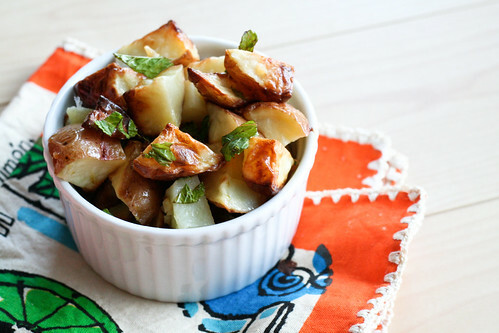 I adore roasted potatoes and have recently discovered that I’m a big fan of the Mojito too. Love bringing THAT together in such a tasty way. Got a good Mojito recipe too?